This paper analyses a crop of jokes that circulated in China over the winter of 2013-2014 and which appear to have retained currency in 2018. They expressed widespread public anger about official failure to take action to reduce environmental pollution. It argues that they are an example of the use of the use of satirical humour as a weapon by the powerless for indirect criticism of authorities, of the type encapsulated by the Chinese proverb “Point at the mulberry to curse the locust tree” (Zhi sang ma huai 指桑骂槐). Cet article analyse un échantillon de mots d’esprit parus sur l’internet chinois pendant l’hiver 2013-14 et qui continuent à circuler en 2018. Ces textes peuvent être lus comme l’expression d'un tollé général face à l’inaction des autorités publiques face à la pollution environnementale, et donc comme cas de figure d’humour satirique instrumentalisé par les masses impuissantes. Dans le contexte chinois, cette démarche s’inscrit dans une tradition de critique indirecte du régime renvoyant au vieux proverbe « Désigner le mûrier en injuriant l’acacia » (Zhi sang ma huai 指桑骂槐). 1This paper describes a crop of jokes that circulated in China over the winter of 2013/2014. They expressed widespread public anger about official failure to take action to reduce environmental pollution. It argues that they are an example of the use of the use of satirical humour as a weapon by the powerless for indirect criticism of authorities, of the type encapsulated by the Chinese proverb “Point at the mulberry to curse the locust tree” (Zhi sang ma huai 指桑骂槐). 2Air pollution has been a major problem in China for decades but its seriousness was consistently downplayed, leading to increasing frustration on the part of the general public and growing distrust in official statements. In China, direct criticism of the Party and government is dangerous so almost the only method available to the man and woman in the street was to create and circulate sarcastic jokes on the Internet, as will be shown later in this paper. The scale of joking escalated although it could hardly be called a campaign, since that implies some degree of coordination of action and a leading journalist, sensitive to the undercurrents, decided to take action, even at the risk of her career. I want to tell you that the Chinese government is determined to tackle environmental pollution, and tremendous efforts have been made in this regard. The progress we have made still falls far short of the expectation of our people. Last year I said that the Chinese government would declare a war against environmental pollution. We are determined to carry forward our efforts until we achieve our goal. 4Chai Jing called for public action and reporting of violation of environmental standards that up to that point had been flagrantly ignored by industrial companies and developers. This is probably where she overstepped unwritten rules and is the reason the video was removed from social media in China (although it had no doubt already been downloaded for circulation and is still available outside China). The Communist Party regards public action as dangerous unless it is coordinated and guided by official bodies. In the eyes of the Party, criticism of government inaction smacks of subversion. Rumourmongers run the risk of interrogation or arrest if they are apprehended. As pointed out above, this is why people use satirical and anonymous internet humour to voice their dissatisfaction with the government. 5In February 2012 the Chinese Academy of Sciences estimated that smog across China was affecting more than 800 million people. Zhong Nanshan, President of the Chinese Medical Association, described air pollution as a greater threat to human health than the 2002 SARS viral respiratory epidemic. He said, “Great efforts are needed, in every possible way, to improve the basic living environment of human beings.” He noted increases in lung cancer and heart disease due to air pollution, as evidenced by cities with heavy vehicular traffic and polluting industries having greater rates of lung cancer than rural areas, even though both had similar rates of tobacco smoking (Li: 2012; Watts: 2012). 6Until recently, most domestic heating in Beijing relied on low-quality coal and local power stations that blanketed the city with smoke in winter. The city has suffered from spring dust storms for centuries and residents still complain about fine yellow sand that gets into noses and throats and every corner of the house even though their windows are taped shut in winter and spring. (Foreigners living in Beijing invented a chestnut dessert dish that they jokingly named “Peking dust” for its fine brown powdery consistency.) When factories were built in and around the city after the communist victory in 1949, industrial emissions added chemical smog to the dust, with the worst polluter undoubtedly being Shougang (Beijing Steel Mill). Prior to the Olympic Games in 2008 a large part of the mill was moved out of Beijing in order to improve air quality. From 2008 to 2012 the Chinese government repeatedly claimed success in reducing air pollution through factory closures and the introduction of regulatory measures. Certainly, sulphur dioxide emissions were cut following the introduction of controls on emissions from coal-burning power plants, however, official data on air quality at that time did not include information on ozone and particulates (known as PM2.5, that is, matter smaller than 2.5 micrometres in size), which are generally regarded as most harmful to health. The American Embassy in Beijing, concerned for the health of their staff, took readings of air quality from their own measuring equipment. When these embassy figures became public knowledge, the discrepancies with government data were widely noted and discussed on the Internet (US Embassy; Mu: 2013). Officials denied the readings and accused the US of “irresponsible actions.” On 5 June 2012, Liu Weimin, a Foreign Ministry spokesperson, said, “Foreign embassies and consulates in China don’t have the legal authority to monitor China’s environment or release relevant data, nor do they have the professional capabilities or conditions to do so” (Jiang and Lai: 2012). 7The public mistrusted official pronouncements and, as the year 2012 wore on, it was proved that they had good cause to do so. In June, when discrepancies grew between air quality readings by the Beijing Observatory and by the American Embassy, foreign diplomatic offices were asked to stop publishing “inaccurate and unlawful” data (Xinhua: 2012). For instance, the American Embassy ranked Beijing air quality as “very unhealthy” on 5 June with 199 PM2.5, while the Beijing Municipal Environmental Protection Bureau ranked it as “good” with 51 and 79 PM2.5. These results may have reflected the locations of sampling equipment, but in January 2013 even the official data averaged over 300 with readings of up to 700 at some stations, while the Embassy recorded 800 on 12 January (Economist: 2013), exceeding the maximum 755 μg that their equipment could measure. 8Beijing was not the only city in China affected by high levels of air pollution. According to the World Bank, the cities with the highest PM2.5 readings included Xi’an in the central west, Chongqing in the southwest and Harbin in the northeast. (World Bank: 2013). Air pollution originating in China was even detected in Japan and California. On October 21, 2013, record levels of smog closed the Harbin Airport along with all schools in the area. Particulate levels of more than 50 times the WHO-recommended daily level were reported in Beijing (BBC: 2013). In February 2014, the capital city was overcome by extreme air pollution. Official guidelines were issued to the press not to blame the government for the deterioration in air quality. Some blogs critical of the lack of action by authorities were removed from the internet (Levin: 2014; China Digital Times: 2014a). President Xi Jinping and Wang Anshun, Mayor of Beijing, went on a walkabout through Beijing laneways to press the flesh in the lead up to the March 2014 National People’s Congress. The press noted that neither man was wearing a facemask, an indication that they did not see air pollution as having reached dangerous levels. It might also be interpreted as bravado (Moore: 2014). This official demarche particularly aroused cynical comments and jokes, as will be shown later. 9Environmental lobbyists in China are a small but dedicated group and they daringly exerted pressure on the government throughout this period. By 2014, their efforts, supported by the growing crop of Internet jokes about smog, began to bear fruit. Government orders for stricter monitoring were rolled out across the country. In 2015, all major cities were included in the monitoring and reporting system. The public reaction to these orders was positive, but after so many official announcements about increased control measures, online bloggers were sceptical as to whether they would be enforced this time. 10The rapid take-up of text messaging, WeChat and other Internet-based social media in China has many implications for the state and for society and has been widely discussed, particularly as to whether it promotes the growth of civil society and personal freedoms or assists with state control and censorship (Zheng: 2008). These new communication methods allow for the rapid dissemination of jokes and comic forms such as shunkouliu, particularly relating to hot-button issues of the day. Topics may range from comments on celebrities, television shows, current affairs, the market, the weather and, of course, politics. Expression is relatively free on the Internet, but this is a limited space. Subaltern humour does not in itself produce political change, but it can be a “canary in the mine” indicator of concerns that the state cannot ignore, and in this way, it can presage decline in its public standing. 11Faced with official stonewalling and government denial of the seriousness of air and environmental pollution, together with instructions to the press not to blame the government or risk retaliatory action, the public turned to mockery and an absolute deluge of jokes erupted and circulated on the internet. In 2014, blogger “Duan Zifang” posted a note about how excited he was to meet the leaders during their walkabout in the lead up to the National People’s Congress, as mentioned above, and attached a photo that he had taken with “The Great Man, Mr Xi” – a blank picture of swirling fog, as shown in Figure One. 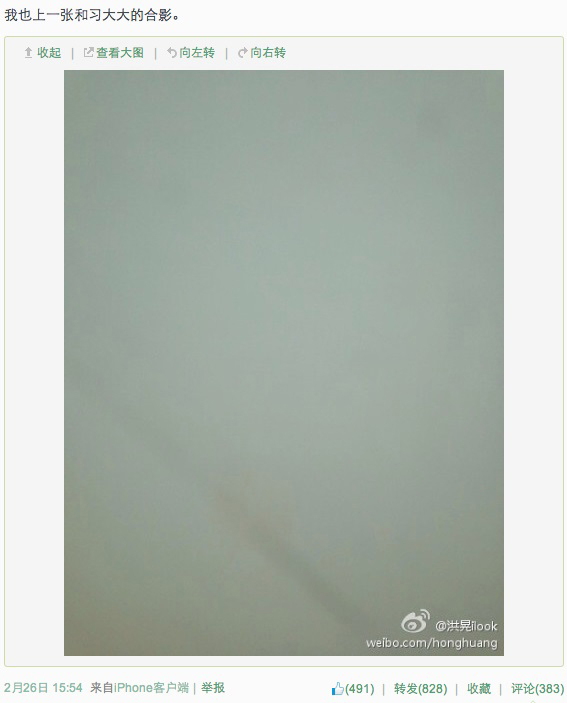 12This image and his entire blog have been censored on the web but can still be accessed from various sources (China Digital Times: 2014b). Fig. 1: SELFIE WITH THE GREAT MAN, MR XI. 13This was only one of a multitude of jokes circulating on the internet at the beginning of 2014. A selection of eighteen is provided here, with background comments to elaborate their cultural context. The reader should note that no sources have provided for these jokes. They are ephemeral, created, passed on, modified and deleted, sometimes in hours rather than days, so that it is impossible to credit the authors and original website addresses. They were collected personally by the author from personal contacts in China through email, and from micro-bloggers on Weibo social media during the period December 2013 to March 2014. 14Since 2014, Weibo has cracked down on the use of aliases and has also increasingly blocked posts on “sensitive” topics. As a result Weibo usage has declined rapidly and it has largely been replaced by WeChat, which has many technically advanced features but is also subject to strict censorship. Joking on WeChat, like Weibo, is dangerous if it infringes security regulations. Environmental issues are borderline security concerns for the Chinese government: that is to say, they are not subject to a generic ban but may be blacklisted from time to time. The collection of jokes detailed below related specifically to air quality concerns in 2013-2014. Since they achieved a concrete result in Chai Jing’s documentary, they achieved their original purpose and subsequently largely disappeared. Nevertheless, some of them have resurfaced from time to time, proving that a joke meme can have an extended shelf life. For instance, Michael Zhao, correspondent for The New York Times, reported Joke 17 from the list below collected during a visit to Shenyang in NE China in November 2015 (Zhao: 2015). On a visit to Beijing in June 2018, the author also proposed some of them verbally to contacts and was able to verify that they were still recalled to some extent. 16Joke 1: A (Chinese) lady went to London for the first time and also for the first time encountered a thick fog. She got lost and she lost her glasses. Then she heard a quiet voice from someone nearby, speaking in Chinese, “Are you lost? Where do you want to go? I can take you there.” That person led her round and about, and quickly got her to her destination. When they parted, she saw his face faintly through the fog and asked out of curiosity, “Are you blind?” He laughed and answered, “No, I am from Beijing” (explanation: he was used to navigating with poor visibility). 18Joke 2: The air pollution has been really bad recently, and netizens everywhere have raised demands for a suitable official translation into Chinese of the term PM2.5 (scientific terms are generally translated not phonetically but according to their meaning). All sorts of answers have been proposed. Among the more serious suggestions was “Public Mist Fountain” (Gongwu yuan公务员, a complicated play on words where gong “public”, wu 雾“mist” or wu “affairs”, and yuan 源 “fountain” or yuan 元 “particle”, taken together are also a pun for “public servant”); a more elevated one was “Dust of the Capital” (a term found in classical poetry); a more powerful one was “Jenghis Khan” (the original name, Chenjisi han 陈吉思汗, rewritten using homophones as follows: chen 尘 “dust”, ji 疾 “plague”, si 思 “thinking” and han 汗 “sweat”); a more optimistic one was “Dust World Beauty” (a pun on Chen Shimei, a character from Peking Opera renowned as faithless and heartless); a more playful one was “Dust Habit Breath” (a pun on Chen Guanxi, a Canadian/Hong Kong pop star); and one with more emotional effect was “Feed the People Swallowing Smog” (a pun on Wei renmin fuwu 为人民服务, a famous Maoist slogan meaning “Serve the people”). 22Joke 4: Just heard a broadcast from the Beijing Transport Radio Station. Someone rang the station to speak to the presenter, nearly in tears, saying that the fog was so thick that he couldn’t see the traffic lights, and as a consequence he had missed four or five lights in succession. He didn’t know what to do. The presenter comforted him saying it would be OK because the camera couldn’t detect his number plate. 28Joke 7: The situation in Shanghai is like this: You take the dog for a walk; the lead is in your hand: you can see the lead, but not your hand; when the dog barks, you walk. 32Joke 9: Rui Chenggang (a well-known CCTV journalist) interviews Gary Locke: “China is your ancestral home. When you leave, wouldn’t you like to take some soil from your homeland with you?” Gary Locke replies: “Take what? My lungs are full of it already. 44Joke 15: The Buddha saw that the King of the Monkeys looked like a little husun猢狲 (macaque) monkey, so he gave him the family name Sun. As for his personal name, the Buddha looked at the colour of the sky, rubbed his eyes and said, “You had better be called Wukong 悟空 (wu 雾 is a homophone for ‘fog’ and kong means ‘space’)” and that is how Wukong got his name. 46Joke 16: Lovers going for a walk should hold hands. If they come to a tree and are forced to part hands, they may get past the tree but lose the person, and then their lover may be lost forever. 50Joke 18: A man went on a tour to Hulunbuir (in Inner Mongolia). Alighting from the plane, he breathed deeply. Alas, with such beautiful fresh air of such good quality, his physique was not able to stand the shock and he fainted away. An ambulance officer came to his assistance and asked people, “Where is he from?” “Beijing.” The officer connected the oxygen tube to the exhaust pipe of his vehicle and let him inhale a few breaths, after which he revived. 51Technically, these jokes display several features characteristic of Chinese humour (Chey: 2012). Some analytical comments highlight where they belong in its millennia-long history. 52First, even a casual reading draws the reader’s attention to the striking number of puns in these jokes. Chinese language, consisting largely of single characters and a limited range of sounds, is rich in homophones for syllables and words. Most languages have punning possibilities but these are particularly prevalent in Chinese. For instance, the standard Chinese Cihai Dictionary lists 149 characters with different meanings all pronounced yi in the fourth or falling tone. Puns are used widely for humorous effect and are one of the typical features of jokes both current and traditional. 53Secondly, Chinese jokes regularly reinforce shared cultural values by reference to well-known stories, characters and episodes in literary classics, so, in the selection above, references are made to Peking Opera and to the classic novel Xi you ji 西游记, translated into English here as Journey to the West. This novel is well-known throughout China in its original form and also as the subject of operas, television serials and children’s cartoons. 54Readers may also note references in the jokes to geographical locations in China, such as Beijing, Shanghai, Nanjing, Harbin and Inner Mongolia. These add richness for the Chinese reader because they reinforce humorous stereotypes of people from these different locations. Shanghai people are often portrayed as materialistic, so when the Beijing resident laments that he cannot see the portrait of Chairman Mao in the political centre of China, the Shanghainese translates this into regret at not being able to decipher the denomination of his banknote. People from the Northeast and Harbin are seen as rather dull and unambitious, so Harbin students are more interested in making pocket money than in studying, and Harbin drivers find the road signs but lose their cars. 55Some of the jokes concern proper names – for instance for PM2.5 and for the Monkey Sun Wukong. Confucius stressed the importance of knowing things by their correct names. Without this, he implied, one could not correctly understand political or social affairs. In the 21st century, this is still an important issue for Chinese people. Families take great care choosing personal names for children that will encourage them to lead virtuous lives. Political enemies and media targets are demeaned by attaching insulting nicknames. Jokes about names therefore have more significance in Chinese culture than in the West. 56As Jessica Milner Davis has noted, “Joking against rule-makers is often more attractive to humorists than joking for them – it offers greater personal satisfaction and peer-entertainment […] Humour that is truly political critiques the hypocrisy of an entire political system” (Davis: 2013). X.L. Ding adds that Chinese citizens today enjoy more freedom than in the past, including freedom to vent their feelings through humour. Ding has collected jokes dating back to the economic reforms of the 1980s that reflect Chinese people’s concerns with issues such as corruption and bureaucratism. Based on this research, he has proposed a link between the expression of humour and social freedoms. In the 21st century people have embraced the internet as a medium for creating and circulating humour through spoofs and jokes, in part because of its relative anonymity and speed of circulation. Humour on the Chinese internet is presently flourishing because although social conditions have improved in some ways, personal freedom is still strictly limited (Ding: 2013). 57It is often said that humour is the weapon of the defenceless. Chinese jokesters certainly have no practical way of changing the political system. A visual internet joke dating from the same period as the jokes listed above makes this point (see Figure Two). 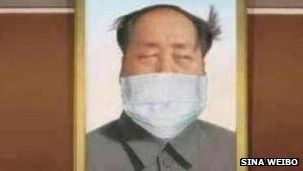 It shows the portrait of Chairman Mao that dominates Tiananmen Square in central Beijing, updated with a gritty hairdo, eyes closed against the dust, and a face mask (Li: 2014). 58Evidently, behind all these jokes about air pollution, hidden barbs are pointed squarely at the authorities, the government and the ruling Chinese Communist Party. Constrained by regulation and fear of punishment, their authors appropriate the language of officialdom and turn it on its head for humorous effect. 59In Chinese culture it is common to use indirect criticism not only as a means of saving face for the person who is being attacked but also as a tactic in warfare. Sarcastic humour is one such stratagem, as defined by Sun Zi in his Art of War (Sun Zi bing fa孙子兵法; see Minford: 2002). In Chapter Five, Sun Zi outlined several “proximate strategies”, the second of which is, “Point at the mulberry tree to curse the locust tree”. The point of this aphorism is that the mulberry tree is a useful plant, providing edible fruit as well as leaves to feed silkworms, but the locust tree (Gleditsia sinensis) has nasty thorns on its trunk that are a danger to men and beasts, even though it also has useful seeds with medicinal properties. Sun Zi’s advice was intended for military commanders who were unable to attack the enemy directly because of their weak or disadvantageous positions. They were advised to substitute one form of attack for another and to confuse and weaken the enemy by subterfuge, insidious slander and rumours. The result would be that the enemy was forced to reveal its hand and come out into the open, while the attacker remained hidden and invulnerable. Translating this advice into the current political climate, it is clear that this is exactly how the netizens of China hope to use humour to counter government authorities who, they believe, are only concerned about their own well-being and not the welfare of the people. 61On 5 March 2014, the opening day of the National People’s Congress, a fortunate strong wind produced rare blue skies. Over two days of meetings, environmental problems were discussed and new policies were announced, including a promise to improve air quality in major cities across China. The first ever “red alert” warning of unsafe air quality was issued on 9 December 2015 when official readings reached 300 pmµ, although some bloggers noted that the level had reached 900 the previous week. Since then authorities have revised the trigger for “red alert” level upwards. Since the end of March 2016, warnings have only been issued when the level reaches 500 pmµ in one day, 300 for two days in a row or 200 for four days. This has reduced the number of warnings significantly but is unlikely to lift public confidence in the government’s commitment to solving the problem of air quality. At the time of writing, there have been some improvements but, on a visit by the author to Beijing in June/July 2018, a season that usually has more rain and better air quality, there were three days when air quality of 500 was ranked “hazardous” according to a widely-used mobile phone app (BANSHIrNE: 2018). BANSHIrNE. http://www.yr.no/placehina/Beijing/Beijing/forecast.xml.h based on data from: http://www.yr.no/place/China/Beijing/Beijing (accessed 7 July 2018). BBC World Service, 21 October 2013. “Northern China smog closes schools and airport in Harbin.” Available at http://www.bbc.com/news/world-asia-china-24579101 (accessed 22 May 2016). Chey, Jocelyn, “Youmo and the Chinese sense of humour,” in Chey, Jocelyn and Davis, Jessica Milner (eds), Humour in Chinese Life and Letters: Classical and Traditional Approaches, Hong Kong: Hong Kong University Press. 2012, p. 20-47. China Digital Times, 27 February 2014a, “Minitrue: We’re all to blame for the smog”, (quoting Hebei Daily 26 February 2014). Available at http://chinadigitaltimes.net/2014/02/minitrue-blame-smog (accessed 22 May 2016). China Digital Times, 27 February 2014b, “Netizen voices: President Xi breathes with the people.” Available at http://chinadigitaltimes.net/2014/02/netizen-voices-president-xi-breathes-people/ (accessed 22 May 2016). Davis, Jessica Milner, “Humour in its cultural context,” in Davis, Jessica Milner and Chey, Jocelyn (eds), Humour in Chinese Life and Culture: Resistance and Control in Modern Times, Hong Kong: Hong Kong University Press, 2013, p. 1-21. Ding, X. L. “Freedom and political humour: Their social meaning in contemporary China”, in Davis, Jessica Milner and Chey, Jocelyn (eds). Humour in Chinese Life and Culture. Hong Kong: Hong Kong University Press, 2013, p. 231-253. Economist, 14 January 2013, “Beijing’s air pollution: Blackest day.” Available at http://www.economist.com/blogs/analects/2013/01/beijings-air-pollution (accessed 22 May 2016). Jiang, Steven and Alexis Lai, “China: Haze isn’t foreign embassies’ business”, CNN Global Newsview, 6 June 2012. Available at http://edition.cnn.com/2012/06/06/world/asia/china-foreign-embassy-pollution-monitor/index.html (accessed 22 May 2016). Levin, Dan, “In Beijing complaints about smog grow louder and retaliation grows swifter”, Sinosphere: Dispatches from China, 25 February 2014. Available at http://sinosphere.blogs.nytimes.com/2014/02/25/in-beijing-complaints-about-smog-grow-louder-and-retaliation-grows-swifter/ (accessed 22 May 2016). Li, Amy, “Even Mao’s wearing a mask: Jokes and parodies abound as Chinese poke fun at smog problem”, South China Morning Post, 26 February 2014. Available at http://www.scmp.com/news/china-insider/article/1435525/even-maos-wearing-mask-jokes-and-parodies-abound-chinese-poke-fun (accessed 22 May 2016). Li Wenfang, “Academic claims air pollution is more frightening than SARS virus”, China Daily, 1 February 2012, available at http://www.chinadaily.com.cn/china/2013-02/01/content_16192311.htm (accessed 28 February 2014). Minford, John (trans. ), The Art of War, New York:Viking, 2002. Moore, Scott M, “Pollution without revolution: Why China’s environmental crisis won’t bring down the regime”, Foreign Affairs, 10 June 2014. Available at https://www.foreignaffairs.com/articles/china/2014-06-10/pollution-without-revolution (accessed 22 May 2016). Mu, Eric, “Air pollution boosts companies in emissions analysis and filtration”, Danwei 7 November 2013. Available at http://www.danwei.com/air-pollution-boosts-companies-in-emissions-analysis-and-filtration/ (accessed 22 May 2016). State Council, The People’s Republic of China, “Full transcript of Premier’s press conference”. Available at http://english.gov.cn/premier/news/2015/03/15/content_281475071837425.htm (accessed 22 May 2016). US Embassy Beijing Air Quality Readings. Available at http://beijing.usembassy-china.org.cn/aqirecent3.html (accessed 22 May 2016). Watts, Jonathan, “Air pollution could become China's biggest health threat, expert warns,” The Guardian, 16 March 2012. Available at http://www.guardian.co.uk/environment/2012/mar/16/air-pollution-biggest-threat-china (accessed 22 May2016). World Bank, “Air Pollution” Table 3.14, World Development Indicators 2013. World Bank Washington, DC. Xinhua, 5 June 2012. “Foreign embassies' air data issuing inaccurate, unlawful: official”. Available at http://news.xinhuanet.com/english/china/2012-06/05/c_131633044.htm (accessed 22 May 2016). Zhao, Michael, “China’s joking on smog,” ChinaFile, 30 November 2015. Available at www.chinafile.com/reporting-opinion/green-room/china-joking-smog (accessed 8 July 2018). Zheng, Yongnian, Technological empowerment: The Internet, state, and society in China, Stanford, Stanford University Press, 2008.